Ajax TOCCO Magnethermic is currently seeking an experienced, accomplished, self-motivated mechanical Engineer to maintain and support our industry-leading products and systems. The Mechanical Engineer will design, detail, and analyze induction equipment to meet customer specifications. The ideal candidate is an inventive thinker that is capable of working through technical challenges and employing pragmatic solutions. This is a fantastic opportunity to join a team that provides integrated services to meet our clients’ needs both locally and across the globe. ATTN: Human Resources, Ajax Tocco Magnethermic, 1745 Overland Avenue, Warren, Ohio 44483. Ajax TOCCO Magnethermic is seeking a Control Systems/Automation Engineer to provide specialized technical expertise in the application and use of control, automation technology. Perform as a lead discipline engineer on single or multi-discipline projects. Generate control schematics, control panel layouts, Bill of Materials, and drawings utilizing Autocad Electrical. The ideal candidate has working knowledge of PLC & HMI programming as well as strong problem solving skills. Robotics experience a plus. Perform basic field commissioning and start-up of ATM process control systems. This is a fantastic opportunity to join a team that provides integrated services to meet our clients’ needs both locally and across the globe. Ajax TOCCO Magnethermic is currently seeking an experienced, accomplished, self-motivated Electrical Engineer to maintain and support our industry-leading products and systems. The Electrical Engineer will work across a variety of functional groups that are directly involved in engineering, product development, implementation, and international contract manufacturing partners. The ideal candidate is an inventive problem solver that is capable of working through technical challenges and employing pragmatic solutions. This is a fantastic opportunity to join a team that provides integrated services to eet our clients’ needs both locally and across the globe. Responsible for successfully managing assigned projects from start to finish. Goal is to ensure projects are delivered on time, at or under budget, while keeping customers informed of our progress. Main point of contact between Ajax Tocco and customers. Must be prepared to provide a detail project status to upper management at any given time. Good verbal and written communication skill. Be able to work with Microsoft Project to present accurate project detail to customer and management. Develop professional and personal relationships with potential and current customers. Be able to train other project managers to be organized, efficient, and proficient. Review contracts and purchase orders for every assigned project, understand payment terms, job cost estimates, and project schedules to ensure complete understanding of the project. Generate and revise project schedules. Communicate changes to customers and internal organizations. Understand processes and procedures. Be able to process engineering releases (POR’s and POC’s) in timely manner. Monitor project status and provide input when necessary. Ensure other functional teams (Sales, Material, Engineering, Production Control, Manufacturing, Test, and Paint) meet their scheduled commitments. Communicate delays to upper managements as soon as possible. Monitor projects daily. Identify potential / actual project delays (long lead parts etc. ), advise how the delays will affect schedules and present work load. As often as necessary, compare actual costs (engineering, material and labor) to budgeted costs. Work with appropriate team members to determine if a lesser cost option can be used to avoid being over budget and maintain quality. Report budget overages to upper management. Must be able to provide specific reason(s) that caused the overage. Schedule periodic conference calls and meeting with customers to keep them informed of our progress on their projects. Project Managers, on rare occasions, may be asked to travel to customer’s facility. Communicate with sales team in advance when possible delay might occur. Work with accounting team to ensure invoices are submitted to customers in advance in accordance with purchase orders / contract terms. Follow up with customers, when necessary, regarding unpaid invoices. Provide project updates on a weekly basis or as required. Maintain project folders, from start to finish, including pictures of equipment prior to shipping and after it is loaded onto trucks. Build relationships with customers that will support our bids for future business. Advise sales team of possible business opportunities. Look for opportunities to improve the flow of information and products to minimize waste and improve efficiency through the organization. Bachelor’s degree from a college or accredited university preferred. Minimum of 5 years project management experience, preferably in a manufacturing environment. Strong personal computer skill in Microsoft package including projects. Looking for a career and not just another job? Looking for a company/position where you have direct influence and your opinion matters? Field service staff have excellent job security and is a position that will open up internal advancement opportunities. The president of our company, the head of our R&D, lead engineering, applications engineering, inside/outside sales staff all started in service! The Field Service Technician has the ability to independently install, start-­up, qualify, repair, and train customers on industrial Induction systems. Willing to travel both domestically and internationally. This position requires a significant amount of travel, usually 70+% of a rolling 30 days but on commissioning or international assignments travel can exceed 30 days straight. Most service staff are home on the weekends but is not guaranteed. Work is in industrial facilities and is NOT recommended for candidates seeking an IT position. We are a globally diverse company and the world’s leader in our field. Must be well versed in operating, trouble-­shooting and rectifying problems with complex instrumentation. Requires a high level of proficiency with complex opto/electro/mechanical and fluid systems. Associate’s degree in Electrical Engineering Technology (or related field) and/or five (5) + years of direct work experience with industrial equipment. Must be able to organize, prioritize, and manage multiple tasks in a fast-­paced, stressful environment. Must possess a strong sense of urgency and prioritization. Ability to lift objects from one level to another (over 50 lbs. );; climb stairs, ramps, ladders, and remain standing/seated for long periods of time. This is a salary non-­exempt position that offers a guaranteed 40 hours per week plus you get paid overtime for any hours over 40 if you work it. We use a fixed per-Diem for food, lodging and sundries. Field service employees drive their own vehicles and are reimbursed at the IRS standard, right now $0.54 cents per mile. Click here for a printable pdf of this job posting. Ajax Tocco Magnethermic is seeking an Aftermarket Sales Engineer to develop new business and build on relationships with current customers in Ontario and Quebec. The successful candidate will plan and execute all duties related to the booking of orders for ATM aftermarket induction products in the district, which includes, but is not limited to coils, inductors, coil repairs, lead and bus new/repair, transformer repair, spare parts sales, System Reliability Service (SRS) sales, etc. The candidate should possess a technical diploma or degree in mechanical or electrical technology and be experienced with custom machinery manufacturing. Knowledge of foundry, forging or heat treating industry is an asset. Position offers a competitive salary and benefits package and involves frequent travel. If you want to play a key role with a growing industry leader, please send resume and salary history to caadmin@ajaxtocco.com, or mail to: Human Resources, Ajax Tocco Magnethermic, 333 Station Street, Ajax, Ontario, L1S 1S3, Canada. Ajax Tocco Magnethermic is seeking a Regional Sales Engineer to develop new business and build on relationships with current customers in the Midwest USA. The successful candidate will plan and execute all duties related to the booking of Capital Equipment (CapEx) orders for induction heating and melting equipment products in the territory. The candidate should possess a Bachelor's degree with 5-7 years of technical sales, or other relevant experience. Knowledge of special machinery sales, combustion, thermal processing, or the induction heating / melting industry is an asset. Position offers a competitive salary and benefits package and involves frequent travel. If you want to play a key role with a growing industry leader, please send resume and salary history to HR@ajaxtocco.com, or mail to: Human Resources - 1745 Overland Ave. N.E., Warren, OH 44483. Ajax TOCCO Magnethermic®, a subsidiary of Park-Ohio Holdings Corporation®, designs and manufactures world class induction heating and melting equipment for the foundry, heat treating, bar & tube (OCTG & API), steel processing, strip heating, forging & forming, and vacuum induction melting industries. 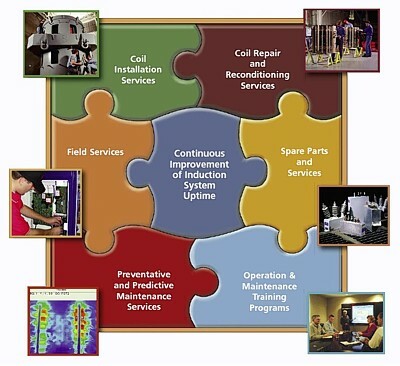 In addition we provide a range of services including laboratory process development, preventative maintenance, equipment repair and parts, coil repair facilities, and installation services.